Unless otherwise stated, all recitals will take place in Tulloch Castle Hotel, not far from Inverness, upstairs in the Grand Hall. 7.30 for 8.00pm start. Watch out for our recital reports from our enthusiastic observer. Brian Yates is our chief reporter. 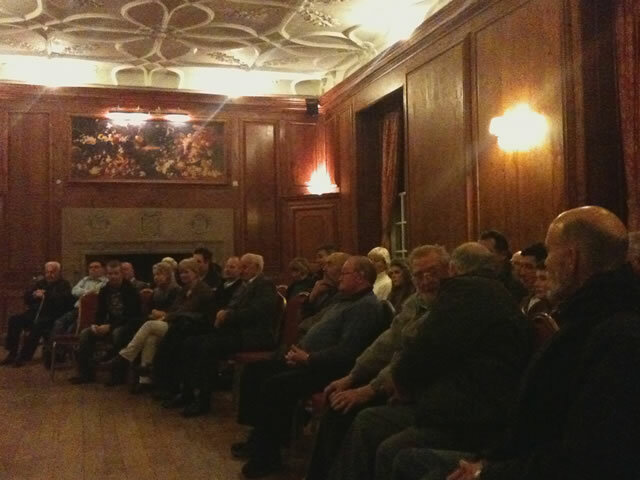 A very appreciative audience of 40 heard a fabulous recital by Decker Forrest at Tulloch Castle on Friday, 24th of February. 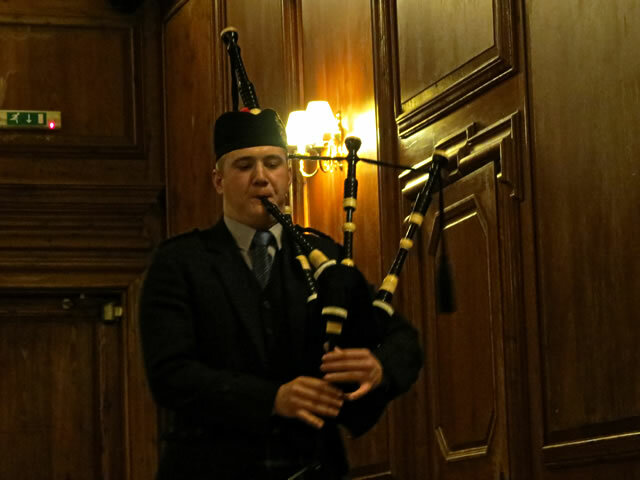 Decker was invited as part of the Inverness Piping Society’s winter concert series and treated us to a superb program of wonderful and seldom heard music, much of it with island connections - particularly Skye. He obviously put an inordinate amount of work into constructing the recital but it certainly paid off handsomely. Winner of the Dunvegan Gold Medal and the Silver Medal from Argyll, Decker, who holds a Doctorate for his thesis on the history and development of Ceol Beag, is a native of San Diego but has made Skye his adopted home. He is now the Programme Leader for the BA Degree in Gaelic and Traditional Music at Sabhal Mòr Ostaig. As such, he is uniquely placed to offer some seldom heard tunes and to comment knowledgeably about them. Both of which he did on Friday leaving his audience very enthused about the evening long after the playing was over. The solidity of Decker’s technique belied the nature of the lyricism of both his playing and his choice of tunes. He began the evening with a set of three wonderful 6/8 marches: “Miss MacDonald of Uig” by Donald MacLeod; a second highly melodic tune which, ironically, he couldn’t name; and James Robertson’s famous “Farewell to the Creeks”. The unknown tune was so not for lack of trying, none of his former bandmates he called in Field Marshall knew the name and neither did anyone in the audience volunteer a title. If I can find it, I’ll post it here. He continued the program with some light strathspeys and reels: Paul K’s Strathspey, Mac an Irish, This Is How the Ladies Dance, Bog an Lochan, The Thrush Is on the Tree-Top, Col. MacLeod, and A Mhisg a Chuir an Nollaig Oirnn. Some of these I’d never heard before. Continuing to focus on dances, Decker regaled us with big Ronnie Lawrie’s hornpipe “Ina MacKenzie”, Donald MacLeod’s arrangement of the jig “Over to Uist”, and Donald MacPherson’s jig “Donnie MacGregor”. Varying the texture of the evening, he played Archie MacTaggert’s lovely slow air “Dreams of Caledonia” followed by some competition 2/4s; “David Ross” and “Donald MacLellan of Rothesay”. The latter being father to Angus J.
Decker related the story of when, upon hearing it for the first time, Donald MacLellan was asked his opinion of that 2/4 and replied that he felt “it wasn’t up to Donald MacLeod’s usual standard”. Upon being told that MacLeod was planning to name it after him MacLellan, after a long pause, asked for it to be played again after which he pronounced that, upon a second hearing, it was a fine tune indeed! The marches were followed by some reels with Uist connections (see tune list below). The third reel, Port Sonaidh Roidean being he of the Glasgow Police and a relative of Rona Lightfoot’s. Decker finished the first half with more jigs with island connections, and a stunning, Gaelicised – to my mind anyway – version of “The Sands of Kuwait” by Gordon MacKenzie. It was so different from the version one normally hears that some in the audience were sure it was a different tune that just sounded similar. The tea break is always a great chance to get caught up with people you might not see so frequently over the winter and the craic was lively. I enjoyed having a chat with the MacGillivrays and it was good to see faces of friends and students alike as well, including young ones. Many people were commenting on how good it was to hear so many tunes that were new to them or were seldom heard. Continuing to demonstrate thoughtfulness to his tune selection, Decker linked some of the structure and themes of the second half of the program with those of the first. He began with another Gaelicised (if, as a non-native semi-speaker, I can label it such) version of John Wilson’s “Loch Rannoch”. This he followed with three reels connected with Skye: “Broadford Bay”, “The Ardvasar Blacksmith”, and “The Sound of Sleat”. Speaking of the smith, Decker was playing the very man’s set of 1911, hand engraved, silver and ivory Hendersons. They had that typical full Henderson bass sound which makes a pitch of 478 (my measurement), sound lower because of that drone’s warm, rich fullness. The thistle engraving was nothing short of stunning. It was the touch of a very experienced hand creating a beauty in technique rarely equaled. Decker’s piobaireachd was “Màl an Righ” (The King’s Taxes); considering the looming increases in council taxes and business rates - a timely choice. Listening to him play I was reminded of Rona Lightfoot asking me at the Inverness Highland Games in that distinctive South Uist lilt of hers “Who’s that playing just now?” as she could hear Decker playing his piobaireachd but from where she had been judging he was out of her line of sight. When I told her she replied “Wow. That’s really good!”. No less so was his performance on Friday. And like a good piobaireach, returning to the beginning at the end, in the penultimate set Decker made a connection with the first set by playing “Dr. Allan MacDonald” by Dr Iain MacInnis. Dr. Allan was married to Miss MacDonald of Uig. He finished off the night with more lovely Gaelic airs and Gaelic reels. Superb and thoughtful choices all. These concerts are more than worth the effort to attend. The convivial nature of the evening, combined with the wonderful collection of well played, seldom heard or never before heard tunes on a superb bagpipe, shortened the long drive home on a dark winter’s night. Thanks, Decker. A Mhisg a Chuir an Nollaig Oirnn. Dè Bha Sibh Ris a Chalum Mhòr? Dingwall born Colin MacLellan and his wife Jenny opened the 2016 programme at Tulloch on Friday 19 February. Good crowd. 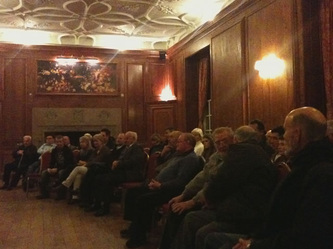 It was a very enjoyable evening in the warm surroundings of the hotel. Some treated themselves to lovely meals in the bar! ​Two great performances, thank you Colin and Jenny. Niall Stewart, brought up in nearby Alness, and tutored by the late great John D Burgess, playing at Tulloch Castle Hotel. Tulloch's Grand Hall has great acoustics for piping. Niall was very ably supported by Cameron MacDougall, a sixth year student at Tain Royal Academy and a pupil of Niall Matheson’s. Displaying a musical and technical prowess not typical of players his age, Cameron revealed why he has been a consistent prize winner on the under 18 circuit. 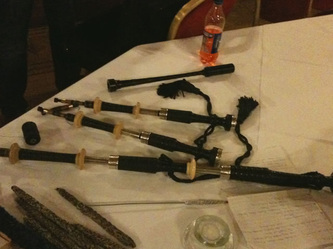 Cameron treated the audience to the sound of his unusual set of pipes: old button mounted full ivory Lawries. They were sweet without being too light and well suited to indoor playing especially in his beautifully played piobaireach ground. Hearing his solid, clean and very assured technique, it’s not difficult to see who his teacher is and that he is honouring Big Niall very well. 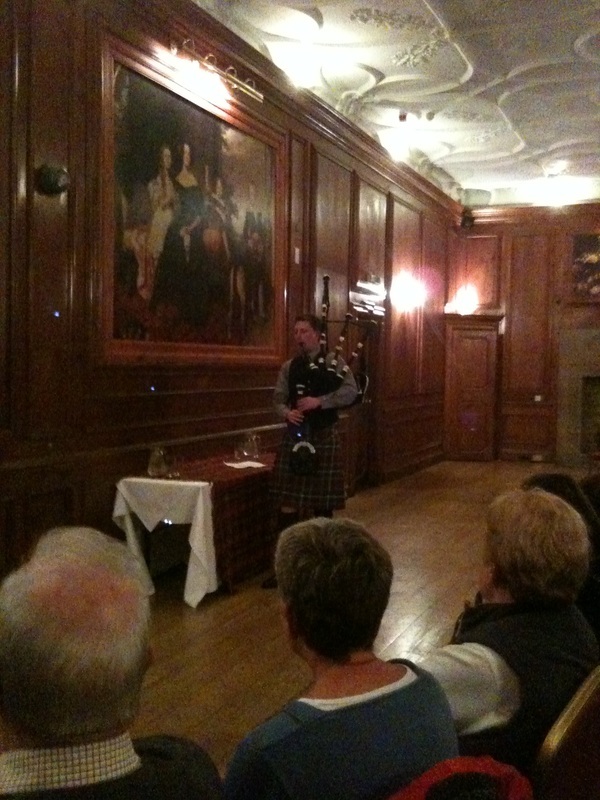 Niall Stewart treated the packed house of 75 to a wonderful evening of piping. He gave a superb recital, playing a well-balanced mix of new music, classic greats, and old favourites. 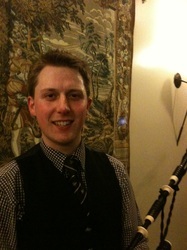 Niall Stewart now teaches pipes in Lochalsh and South Skye. Having won last year’s Silver Star and the MSR at the Glenfiddich, it goes without saying he is in top form - as was abundantly evident last night. He began his first half in a traditional way, warming up the audience with what I think is a very underrated genre: the 6/8 march. His Bengullion and Dovecote Park had all the swing and lift that tunes of this type should have. He followed these with a pair of strathspeys (Glentruim and Dora MacLeod) and a pair of reels (The Sheepwife and Ca’ the Ewes). After a brief re-tune he continued to show the audience why he won what he has this past year playing three 2/4 marches, beginning with the very melodic PM J MacWilliams. This he followed with The 74th’s Farewell to Edinburgh and Arthur Bignold. After a spritely foray into a hornpipe and jigs with The Ladies’ Hornpipe (sometimes called Joe McGanns’Fiddle), The Thief of Lochaber and Alex MacDonald, Niall regaled the audience, just before the break, with an absolutely stunning performance of the not often heard Isobel MacKay. This tune was particularly suited to his immaculately set-up, resonant drones. The long notes of the ground especially made the perfectly balanced harmonics of the drones really shine; particularly the fifths and the surrounding octaves (second, first and third overtones respectively). The fifths were present but not overbearing so that they made the E of the chanter ring but the overtones themselves were not a distraction. Add to that Niall’s immaculate edres and crunluaths whose internal rhythm was balanced, expressive, and very musical - and the audience was treated to a very memorable performance indeed! The post-interval selection of tunes and their performance made the balance of the evening fly by. Opening with a pair of 3/4s (The Bloody Fields of Flanders and Far Over Struy) Niall followed these with a set of 2/4s beginning with another pair of tuneful marches (Tommy MacDonald of Barguillean and QE II’s Welcome to Invergordon). We were then treated to a thoughtfully arranged selection of a slow air and light strathspeys and reels. Beginning with Niall Matheson’s masterpiece Alexander MacDonald of Heisker’s Farewell to the Monach Light (a tune composed for auction by a children’s charity - it was named by the highest bidder), Niall then went into Craig-A-Bodaich, A. A. Cameron’s Strathspey, Seonaidh’s Tune, Devil in the Kitchen, Buntata Sgatan, An Drocaid Clutaich, MacArthur Road, and finished off with Big Picnic. In an echo of the previous set he began his next again with a slow air, Leaving Lochboisdale, but then continued with heavier counterparts of those in the preceding selection: Sandy MacPherson, The Smith of Chilliechassie, Mrs MacPherson of Inveran, and The Little Cascade. No small feat after all the playing he had done thus far. Niall rounded off the recital with a selection of hornpipes and jigs: Donald MacLeod, Crossing the Minch, Skylark’s Ascension, Donella Beaton, and an unusual four part setting of John Patterson’s Mare. It was a superb evening of inspiring and very musical performances, by both players, of well chosen and varied tunes. One of my pupils, who was beaming as she and her mother left, said “I’m going to go home and practice even more!”. Our Reporter was Brian Yates. 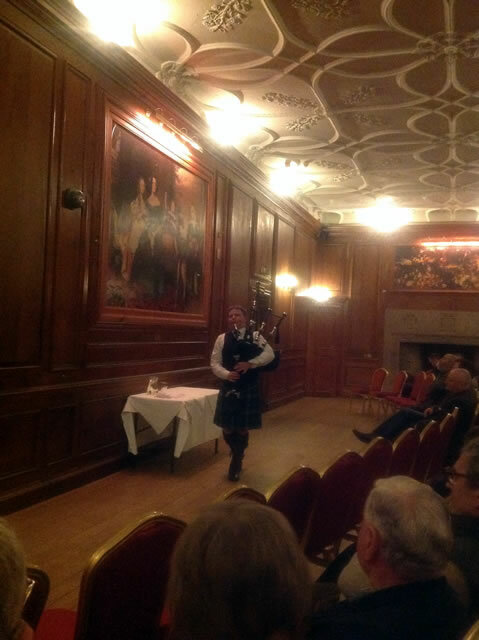 We had a very entertaining evening of piping at Tulloch Castle Hotel with a good sized group of 50 piping enthusiasts in the audience. Archie Drennan, an S5 pupil at Dingwall Academy and who hails from Drumnadrochit started the evening off with good sounding pipes, His selection included three 3/4 marches by Pipe Major John McLellan DCM (the acronym stands for "Distinguished Conduct Medal" - the second-highest military decoration (after the Victoria Cross) for spectacular action). Pipe Major MacLellan won the award for his courageous conduct during the battle of Magersfontein (1899) in South Africa, where he rallied the troops with the sound of his pipes while he was seriously wounded. The tunes were The Highland Brigade at Magersfontein, The Dream Valley of Glendaruel and The Bloody Field of Flanders, played very nicely though the 'Dream Valley' seemed to put Archie into a 'dwam' for a moment but he soon got himself together again with a great rendition of The Bloody Field of Flanders. He gave himself a very demanding and interesting programme of tunes to get through. My favourites being the two 6/8's The MacNeils of Ugadale (PM Mackenzie) and Pipe Major Sam Scott (Peter R. MacLeod). Also nice to see in the program his MSR of Donald MacLellan of Rothesay (PM Donald MacLeod), The Piper’s Bonnet (traditional) and that firm favourite Mrs MacPherson of Inveran (P/M G.S. McLennan). Well done and a very good first public performance. May I say it is great to see a smart young piper playing with correct posture and excellent marching style; no doubt a positive rub-off from Archie's four years with the Army Cadet Force where he is currently a Corporal. Archie was taught by Duncan MacDonald, Maryburgh, and what an excellent job Duncan made too. Margaret and Alastair gave a very enjoyable evening's piping. Two pipers whose technique and mastery is top class. Full repertoire covered, but yours truly was having a night off to just sit and enjoy their performance. Their pipes were sounding great. Callum Beaumont - another night of very, very good piping and what drones! McCallums? Callum comes from Bo’ness, West Lothian - an area steeped in piping from the days of the coal and shale mining pipe bands. He is currently an instructor at the National Piping Centre. His tutors include Bert Smith, Tom Speirs and currently Willie McCallum. 1st Clasp at Northern Meeting, Inverness and 1st Highland Society of London Gold Medal – Argyllshire Gathering, Oban, and more. He opened his recital with the 6/8 Marches Macneill of Ugadale and Games Day at Aboyne, then into Jigs Maiden Dubn an Donais, Lark in the Morning and Cridhe Ur Annag. Great fingerwork. Drones tuned to perfection. Great sound in the Grand Hall at Tulloch Castle, audience spellbound. Then onto Strathspeys and Reels - Maggie Cameron, Dora MacLeod, Fiona MacLeod and Miss Proud. Who taught this boy? Spot on clean finger work. Callum has a girl friend from Brittany and she encourages him to play Breton tunes, so tonight he gave us a collection he had put together starting with a slow air then a dance set. Very nice melodic phrases. Onto finger warming Little Cascade and Alec C MacGregor. The Piobaireachd played was Ronald MacDonald of Morar - faultless, a winning performance, no question, so beautifully phrased and just a delight to listen to those drones. 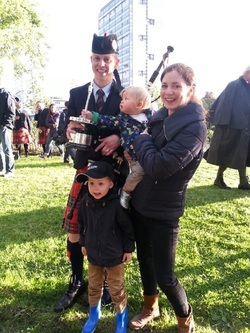 Callum then finished the half with two competition marches - Royal Scottish Pipers Society and Colin Thomson followed by the hornpipes Donald MacLeod and the Pipers Controversy. Time for a cuppa and a chat! Second half hi-lights included the Jigs - The Curlew, Dr Flora MacAuley of Carradale, The Old Wife of the Mill Dust, and Troys Wedding. The ground of the Donald Macleod Piobaireachd Queen Elizabeth II Salute then the MSR selection Glengarry Gathering, Pipers Bonnet and the reel John MacKechnie. There was so much more that I lost track. One of our top pipers. of that there is no doubt. No junior piper tonight, but exams are a problem at this time of the year, however the next recitals (March is Alistair & Margaret Dunn) we will have someone in place. Any volunteers out there ? Simon McKerrell - Simon is one of the leading players of Scottish Highland, Border and Irish Uilleann bagpipes in the world today. Fifteen years experience as a professional musician in both live music. 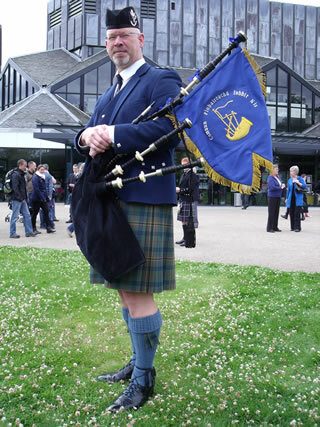 He has worked as the Head of Piping Studies at The National Piping Centre in Glasgow, and has held positions at the Universities of Glasgow and Sheffield and the Royal Conservatoire of Scotland. He is a Lecturer in Music at Newcastle University where he lives with his wife and daughter. He trained with various teachers including Kenny MacDonald, P/M Jimmy Pryde, Colin Pryde, P/M Angus MacDonald and Allan MacDonald, receiving the majority of his piobaireachd tuition from Murray Henderson. Simon has recorded over 11 albums and was a founding member of 'Back of the Moon' (2000-2004) and more recently performs as a solo performer and with his band, Rough Tides (www.myspace.com/roughtides) as well as with the Spirit of Scotland pipe band. 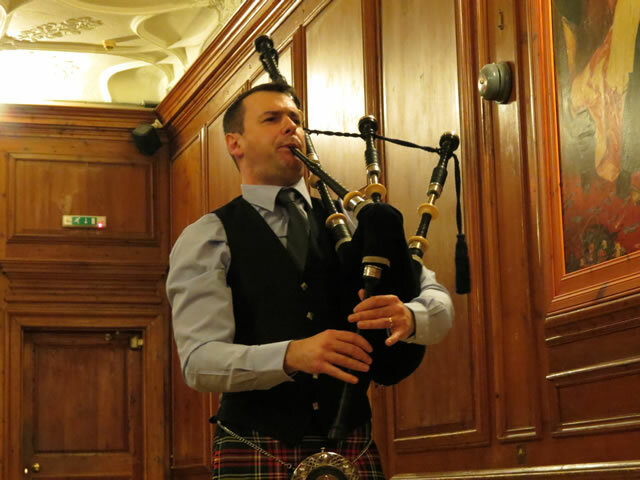 He has won the A-grade MSR at the Northern Meeting (2006) and the Skye Clasp three times (2005, 2006, 2007) as well as numerous other prizes at major international piping competitions. Supporting Simon McKerrell was Tain Royal Academy pupil Cameron Macdougall (15). 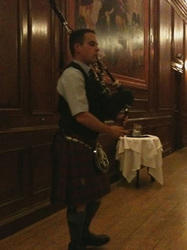 Cameron was playing his very unusual set of R G Lawrie bagpipes with chalice tops to the drones. 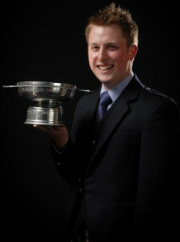 After the long summer break, our opening recital on 23 November 2012 was given by Finlay Johnston, who at this year's Argyllshire Gathering won the gold medal (The Highland Society of London Gold Medal). Finlay has been handed down from his mother a very nice old set of silver and ivory Henderson pipes, giving off such beautiful harmonics via his Ezeedrone reeds and sheepskin bag. The sound from those drones was extremely pleasing to the ear with a perfectly set chanter (the vibrancy of that chanter reed was something that made me green with envy). Sorry folks, not everyone can be a saint! Finlay has near perfect fingers, excellent muscle control. The Grand Hall in Tulloch Castle Hotel is a wonderful place to play and Finlay made full use of the acoustics. He started the evening off with Ronnie McShannon's 9/8 march "Dr Preston's March". Ronnie is Finlay's tutor. From that 9/8 tune he moved into two 6/8's "Mrs Mary Campbell" by Dougie Campbell and Dan MacRae's lovely "The Heights of Cassino". But for me the real highlight of the evening was hearing the piobaireachd "The Young Laird of Islay" played on those old pipes. Finlay was sensitive to his instrument and adapted to the changing circumstances in his recital, with regard to the moisture on his reeds. This enabled us to have, in the second half of the recital, a very enjoyable selection of beautiful tunes - "The Conundrum", "The Jewel of 100 Years" by Phil Cunningham, then into a slow air and round-style hornpipes "Lieutenant Colonel George Latham's Fancy" and "Mike Grey". I think his 3/4s were very well played (bit of the old Gordon Walker) and so pleasing on the ear: "Colin's Cattle", "The Bloody Fields of Flanders", and the "Heroes of Vittoria". Tastefully played and so refreshing. As the evening closed, Finlay played a lovely Breton tune, followed by a selection of enjoyable reels. We are delighted Finlay has said that he will come back to do another recital. 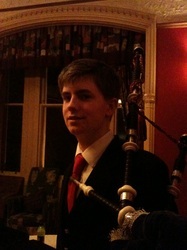 Our young piper was Donald Joseph MacInnes, from Inverness, who gave a sterling performance and shows great promise. Thank you to our audience for your continued support, and we look forward to seeing you all at our next recital. 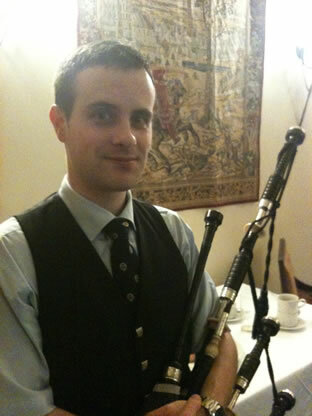 A double-gold medallist piper, Niall established himself as one of the foremost piobaireachd players, as well as being a noted exponent of light music. Kingussie born, but brought up in Newtonmore, Niall joined the Queen's Own Highlanders and he saw service in Northern Ireland and the first Gulf War. Niall, a qualified Piper Major, having passed the Pipe Major's course at the Army School of Piping, runs the 'Cabarfeidh' bagpipe supplies shop in Inverness Market and is the Piping Instructor covering Easter Ross. Niall has twice won the Bratach a'Phiobaire (The Piper's Banner) as overall champion at the 2010 and 2011 Inverness Games. 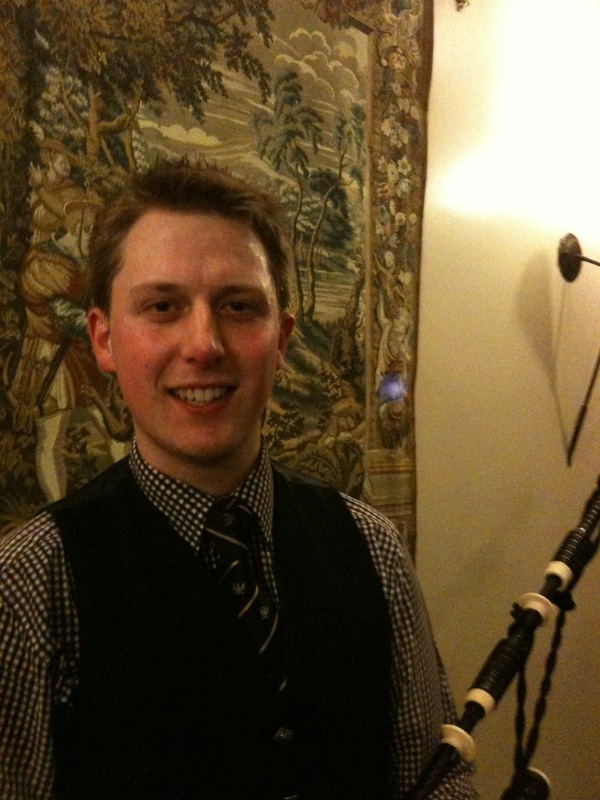 A very popular competitor and recitalist, Niall played his silver and ivory Lawrie's with a Naill chanter, producing a beautiful sound as you would expect from a seasoned and experienced player. A very nice and popular selection of tunes were on the repertoire for the evening, including a 2/4 march Niall had written ten years ago for piper Hugh Watson from Dingwall (ex Seaforth Highlanders). The tune was called Hugh Watson and very nice it was too. Hugh was delighted and expressed his thanks from the floor. Further highlights for me were his 6/8s such as The MacNeils of Ugadale and the 2/4 marches such as Miss Elspeth Campbell, John MacDonald's Welcome to South Uist and followed by John MacDonald of Glencoe, which is a favourite of Niall's and he plays it so well. Another highlight was the enjoyable Donald MacLeod piobaireachd Cabar Feidh Gu Brath, which he played in memory of the late Pipe Major Alasdair Gillies. Naill was joined in the final part of the second half by Charles MacDonald from Inverness, a pupil of Niall's. 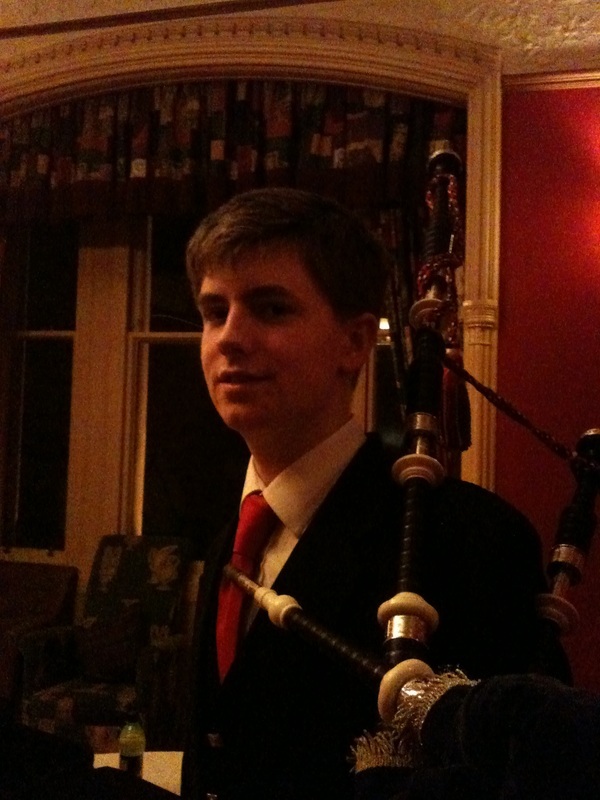 Charles won the under 18 MSR at the Northern Meeting last year and was under 17 Piobaireachd winner at the recent Junior Piping Championships at The National Piping centre in Glasgow. Earlier in the evening, Charles had given a very competent display of his developing talent prior to Niall starting his recital. Charles has long supported the Society and enjoys getting up and playing no matter what. He plays a very nice set of silver and ivory Hendersons, nicely set up, in tune, and which in turn, gives off the best of the piper's playing. Charles is without doubt a very good player. Teaming up with Niall at the end of the second half of the recital was a great idea, and the two pipes were in great harmony, with reels, jigs and hornpipes flying off the fingers! What a way to finish a very enjoyable evening. Pipe Major Niall Matheson during his recital. Pipe Major Matheson and Charles MacDonald play together. Cameron played his set of Hendersons (100+ yrs old) and they were spot on. The drones were unbelievably steady. His secret? Cameron revealed that he has a sheepskin bag, Ryan Canning tenor drone reeds, Murray Henderson bass cane reed, a Kron chanter. Not sure what the chanter reed was, I slipped up there! But just great, so enjoyable to listen to. A great selection of tunes, from Pride of Scotland band marches, Hornpipes, Alan MacDonald compositions, Marches, Strathspeys & reels, and a nice range of Breton tunes and an excellent Lament for the Earl of Antrim - just beautiful. The audience were treated to an excellent performance by young Jamie MacIntosh from Strathpeffer who started the evening off with a fine selection of tunes. Full marks to Jamie who was impeccably turned out.